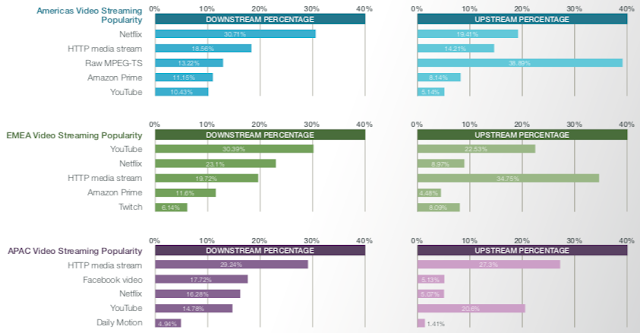 The Global Internet Phenomena Report provided by Sandvine - together with Cisco's Visual Networking Index (VNI) - was always a good source how internet traffic evolves over time, specifically in the context of streaming audio and video content (note: Nielsen's Law of Internet Bandwidth is also worth noting here as well as Bitmovin's Video Developer Survey). I used this report on many of my presentations to highlight the 'importance of multimedia delivery'. Thus, I'm happy to see that on October 2, 2018 Sandvine released a new version of its Global Internet Phenomena Report after a rather long break of two years. The report is available here with some highlights reported below. Almost 58% of downstream traffic on the internet is video and Netflix is 15% of the total downstream volume traffic across the entire internet. The streaming video traffic share comes up with some regional differences (see figure below). Netflix dominates Americas video streaming (30.71%) whereas EMEA is lead by YouTube (30.39%) and APAC is not dominated by any streaming services but "HTTP media stream" (29.24%) in general. Overall, Netflix and YouTube together are still responsible for approx. 50% of the global video streaming traffic share.